Includes resin turret and attachments. The Soviet T-34 tank was one of the better armored vehicles of the Second World War. Not because of any actual long lasting superiority in terms of armament or of armor, but because it was able to be easily built, resulting in large numbers and able to be easily maintained, resulting in more vehicles ready to fight. It was also a case of just having everything right. The Soviets knew that they'd be using mostly conscripts for their military during the war so the focus of weaponry was to make things simple. This lack of complexity did the Soviets well and resulted in equipment that was no only rugged, but could also be rather easily repaired when the need arose. After the initial success of the T-34, it was realized that it needed a bit more firepower. In the Fall of 1943, the installation of an D5-T-85 85mm main gun was undertaken at a Moscow repair factory. The result was successful and in January of 1944, production of this improved version was started in factory 112 at Gorky and continued until April when a more improved ZIS-C-53 85mm gun was chosen for production. 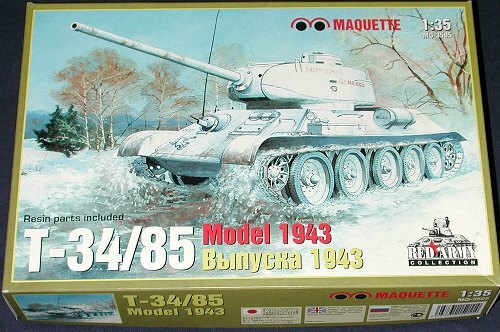 Total number of D5 T-34s produced was around 255. Maquette is a a Russian company that produces not only its own designs, but has also used the molds of other companies and simply reboxes them. I have several ancient Frog kits produced under the Maquette label. Upon opening the box, the first thing I notices is that all the sprues save one were loose in the box. Only one was in a protective bag. I also noticed several spaces in some of the sprues. This is undoubtedly for the turret, which is provided as a separate resin molding. This resin seems to be well detailed. The large moldings are very rough on the mating surfaces and will require some careful clean-up prior to use. The rest of the parts are fairly well done. There are multiple trees of the road wheels and the separate track links so I only included one of each to give you an idea of what they look like. Detailing is on par with other Russian companies at one time or another in their development. These parts have quite a few sink areas where the plastic is thick. Though the construction of the kit will result in some of those being out of view, others, such as on the upper hull, will have to be attended to during the construction phase. 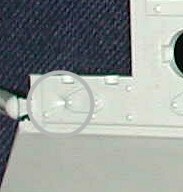 There are also some parts that have ejector pin marks that will need either sanded down or filled. Mold seams are also a bit heavy on some parts. I don't wish to leave the impression that the kit is rife with these problems as that is not the case at all. Sink areas and ejector pin markings are generally only on the larger and thicker parts, so the vast majority of bits are just fine and require no more than the usual preparation. I would also suggest cleaning the sprues in warm, soapy water to remove any mold release residue as there is a bit of it on some parts. A section of string is provided for a tow rope and there is also a section of material for the engine grilles. There are no real options with the kit. Once the parts have been cleaned up, it seems a pretty straight-forward build with no real surprises. The instructions are somewhat minimal compared to those of Tamiya or Italeri, but they do consist of 14 well drawn construction steps. A paint guide is provided with generic paint colors given for the overall tank, but none are provided in the construction phase. The instructions do show where to put the various resin parts so that isn't a problem. Much of the construction will undoubtedly be taken up with the individual track links. Markings are provided for two tanks. Both are quite similarly painted in overall Matt Field Drab with slogans on the side as they are presentation tanks. The decal sheet is well printed and done by ProDecals. I've has some experience with these decals from my Maquette Russian Sub kit and can tell you that they are quite thin and opaque. One must exercise some care when handling them because of their thinness. Overall, it looks like it will build into a very fine model. 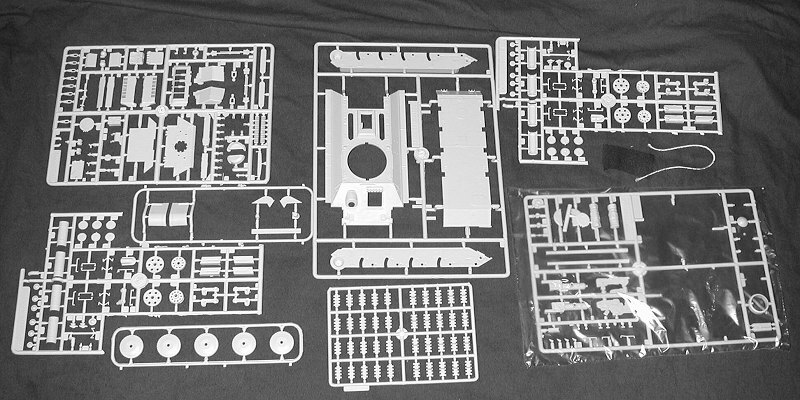 Though not Tamiya quality, it certainly is as good as many Italeri tank kits I've seen and should present little problem for those who have had some experience with these types of kits.